If you’re looking to push lethal wizard combat in a single turn, then I’d highly recommend Capsize , Mystic Speculation and Whispers of the Muse with Isochron Scepter , Dramatic Reversal and Paradox Engine with lots of mana rocks. Infinite buyback casts to scry, draw or bounce permanents while pumping your wizards is a really fun way to kill your opponents. You could add mana rocks and then Isochron Scepter + Dramatic Reversal (neither of which are bad in the deck by themselves). This combo by itself with 2 mana production gives you infinite drake's. 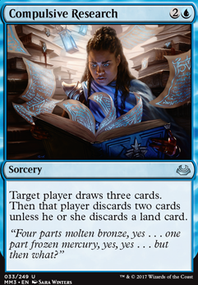 At 3 mana production you have infinite mana, which you can channel into Blue Sun's Zenith ing each of your opponents. Using Whispers of the Muse (again, good with talrand) is another draw to help you dig for your win con once you have infinite mana. First thing I would recommend adding is Thousand-Year Elixir . It's a really good haste enabler on abilities (since Mairsil can eat artifacts). From there you could look at adding the Pili-Pala + Grand Architect package on top of the Dramatic Reversal / Isochron Scepter (if you're going for infinite mana). 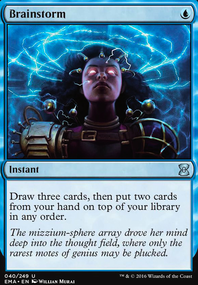 From there I would recommend looking at a small number of outlets, however Blue Sun's Zenith is pretty decent for that since from infinite mana you can draw your deck and go from there. Whispers of the Muse will also let you draw your deck however isn't a combo piece. If you want to use your Keeper combo, I would recommend cutting Phenax - I don't think it adds enough to the deck outside of the combo. Infinite beats or infinite ETB damage is enough, Phenax just feels like a wasted card slot. Card advantage is super important - Ponder , Preordain , Impulse , Brainstorm , Lim-Dul's Vault , Ad Nauseam , Mystic Remora are all really good cards. For ramp, you will want a bit more than you're currently running. Dark Ritual , Talisman of Dominance , Dimir Signet , Fellwar Stone , Simic Signet , etc. are all really good. You can also look at adding Mind Stone . You can sac it and then eat it with Mairsil, giving him a self sac outlet if you do need to reset him for later on. For removal, Toxic Deluge is generally better than Damnation . you also have Rapid Hybridization , Pongify , Chain of Vapor and even some flex cards like Terminate and Dreadbore . gergonthedestroyer on Mizzix of the Izmagnus, I'll burn! I really like some of your ideas to produce mana and will be incorporating them into my version. It's Mizzix in the Mix if you would like to look and see if my ideas work for you. I went more "all in" on the experience counters and have found that colored mana is at a premium. Therefore, I changed my counter spells from things like Counterflux, Dissipate, or Spell Crumple to things like Condescend, Power Sink, or Syncopate. That way I only need one blue open and I always get an experience counter. Mindswipe gives added burn value, and I like Spell Burst over Forbid as the game lock. I also tried to replace creatures with spells where possible, so Archaeomancer turned into Mystic Retrieval and Recall, and Lunar Mystic turned into Whispers of the Muse. I also found that effects like Guttersnipe and Electrostatic Field didn't work as well for me as just having another burn spell. This may just personal style though. Blasphemous Act takes out Mizzix with everything else. You could try Bonfire of the Damned, Sudden Demise, or even Rolling Thunder for some board control. Fanning the Flames looks even better in your list than mine I think. You are right about there being a problem if Mizzix gets too expensive. I added Inexorable Tide to keep the experience counters coming even with Mizzix in the Command Zone. That allows you to just set up for one big turn where you recast him and win. I like what you're going for here, but I see some places where you might consider changes. 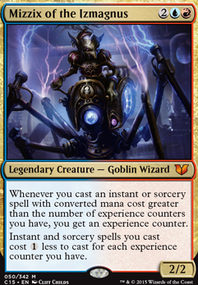 Specifically I like your cantripping combat tricks (buff, commander trigger, and replace themselves, all pretty great), and I like using Prowess creatures to sort of double-dip on the effect your Commander provides. Your average CMC is nice and low, which is great. Unfortunately you're not running very much ramp, in combination with a somewhat low land count. A deck like this is going to be deceptively mana-hungry - you only get your Commander's buff till end of turn, so ideally you want to cast multiple spells in a single turn to pump the team as much as possible. Preferably mid-combat. Multiple spells means a lot of mana. I'd look at adding rocks, especially rocks that are 2CMC or less. Wayfarer's Bauble, Fellwar Stone, Coldsteel Heart, Star Compass are all great budget rocks for a 2-color mana base. Slightly more expensive are Fire Diamond, Sky Diamond, and Gilded Lotus. Since you're using combat and only running two colors, Sword of the Animist would work well too. You have a decent number of cost-reducers for instants and sorceries, but I;ve always found that those aren;t really a good substitute for ramp. They're great cards, and if you build the deck with lots of instants/sorceries with generic mana costs they can really help you cast multiple spells in a turn, but they supplement ramp, they can't actually replace it. Similarly, Mana Geyser costs 5 - it's not really "ramp." It's a one-time effect for a big turn, but you need enough ramp to be able to cast a 5CMC ritual in the first place. You're running several cards that are more optimized for 1v1, 20-life formats. I'm talking about Lightning Bolt, Lightning Strike, and Wizard's Lightning. There are times to play these in Commander, but typically only as part of a combo (Bolt doesnt do much in Commander...unless you can cast infinite bolts, which can be fun). There are much better removal options: Rapid Hybridization, Pongify, Reality Shift, Echoing Truth, Curse of the Swine, Snap, Into the Roil, Commit / Memory, Blink of an Eye. I believe these are all dirt cheap, and most are instants, so you can cast them during combat. If you can spare the cash (and hopefully it'll get a reprint in the next Ravnica set), Cyclonic Rift is the 2nd most-played card in Commander for good reason. It's some of the best removal available in any color. Also bear in mind that "copy spell" effects don;t provide additional cast triggers. If you use Bonus Round, then cast Brainstorm, you still only get two cast triggers total, even though three spells will resolve. 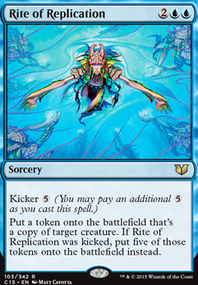 To get extra cast triggers you need wording like on Isochron Scepter - "you may cast the copy." Card draw is fantastically important, and so is evasion. Open Into Wonder does both for you. Kindred Discovery would be pretty much perfect for this deck, and I think it came in this precon so you might already have a copy; otherwise I think the price has risen unfortunately. Card is a powerhouse for tribal decks. Also great for tribal decks are some universal pump effects. Shared Animosity, Coat of Arms, Vanquisher's Banner (also draws cards), Door of Destinies, Adaptive Automaton, Metallic Mimic, Obelisk of Urd all work well. If you can generate tokens consistently, Eldrazi Monument gives evasion, pump, and makes your Wizards indestructible. For some mana-doubling, Caged Sun and Gauntlet of Power can make your lands produce more mana and also pump your creatures. 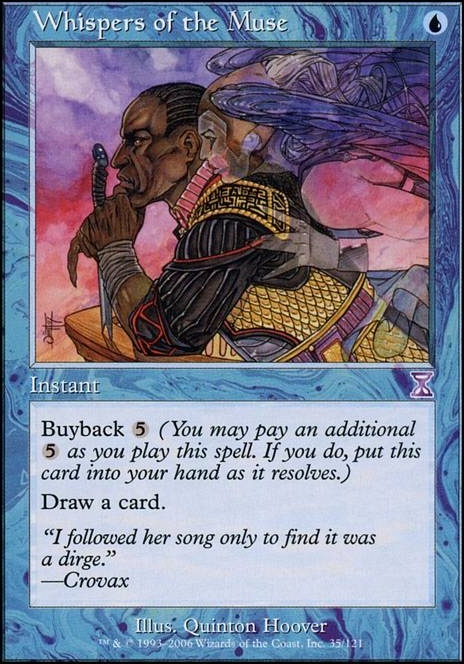 Also consider some Buyback cards - you can spend extra mana to put them back into your hand isntead of the grave as part of their resolution. Capsize, Haze of Rage (this one is particularly perfect for you - the combination of Buyback and Storm pumping your entire team is nuts), Mystic Speculation, Shattering Pulse, Whispers of the Muse, and Seething Anger all look pretty good for this deck. Now, combat damage with no infinite combos is pretty tough to pull off in Commander, where you have 3 opponents typically and everybody starts with 40 life. Thats a lot of damage you need to rack up, and your combat buff effects basically all wear off at the end of the turn, leaving you with a bunch of low-power Wizards for the next turn. I'm going to make some combo-based suggestions - this would be perfectly acceptable in my meta, but everybody's playgroup is different. Some of this will be dirt cheap, some of it will cost a little. You're already running Isochron Scepter. This card is phenomenal. It can help you pull off your main game plan (smash with Wizards), and it can also provide alternative win conditions that you can use if combat becomes unfavorable. Scepter imprinting Dramatic Reversal with enough non-land mana sources to produce 2 mana will untap all your mana rocks, all your Wizards...and the Scepter itself, which lets you reuse it. And it casts the Imprinted card, so you get an Adelize trigger every time. You can do this infinitely to make your whole team infinitely large. If your mana rocks can produce 3 or more mana, you also can produce infinite mana. You can also pair the Scepter with Paradox Engine. This starts to get crazy, because the Engine basically provides the same effect as Dramatic Reversal, but you an Imprint something else onto the Scepter. For example, you can Imprint Reality Shift. Activate Scepter to cast a copy of Shift, targeting an opponent's creature. Engine triggers, untapping the Scepter and your mana rocks. Reality Shift resolves, exiling the creature, and turning the top card of their library into a new creature. Activate the Scepter again to exile the Manifest creature and Manifest the next card of their library. Rinse and repeat until their entire library is in exile. Do that again for all of your opponents who have a creature out. Pass the turn, and let them lose from drawing on an empty deck. You can see how flexible this is. Opponents can stop you with well-timed interaction, but it works super well, and you're playing Blue, so you can hold counterspells to protect yourself. Engine is going up in price, I think its about $20 now, but it's well worth the buy. It'll only get more expensive. I've added Whispers of the Muse to the deck, but I don't run Paradox Engine because my local commander league has is banned, so I don't want to have to switch it out to play it. Dramatic Reversal is a great card for this deck! Bigant1: You should probably consolidate your forum threads into a "Help with Mizzix" Thread. It stops the forums from getting flooded all with help for the same deck. It also means that it provides people with more context about other changes which are happening. On the topic of Seething Song - it's ok but I don't think it warrants a spot. It works in comob with Reiterate but you'd be better with Pyretic Ritual as it still net gains you one mana per cycle (assuming you can buyback for free) but can be fetched with Firemind's Foresight. For ramp, I would recommend adding more mana rocks - you currently have very little in the way fo ramp for Mizzix which can make starving the deck of your commander quite easy. Side note - I would look at either adding Lightning Bolt or more one drop card advantage spells for the Firemind's Foresight package. Currently you only have Brainstorm to dig with and if that's in the graveyard you have to have your mana sink in hand. Whispers of the Muse is very good with Mizzix as it can effectively be : Draw a card.